Phillip W. Simpson is the author of many novels, chapter books and other stories for children. His publishers include Month9books, Macmillan, Penguin, Pearson, Cengage, Raintree and Oxford University Press. He holds an undergraduate degree in Ancient History and Archaeology, a Masters (Hons) degree in Archaeology and a Masters (Hons) degree in Creative Writing from the University of Auckland. Before embarking on his writing career, he joined the army as an officer cadet, owned a comic shop and worked in recruitment in both the UK and Australia. Simpson has woven a captivating tale that presents a different take on not one, but several Greek myths and legends, and the players within. Demi-deity status notwithstanding, it is easy to believe this is the nugget of truth behind the myth of the Minotaur. 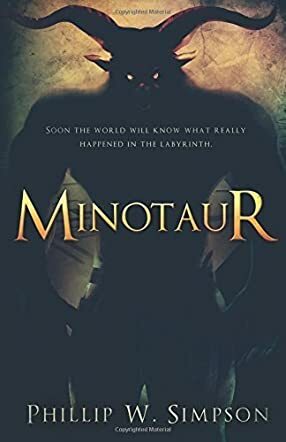 If you enjoy Greek mythology or alternate histories, or you just want an enjoyable read, you’ll definitely want to check out this nifty novel. Be forewarned though - this story is more narrative oriented than many stories today, which only makes sense being that Asterion is recounting his history to Ovid. It takes its time to unfold, allowing you to savour it.